This year as a part of our annual Murphy’s Madness Sale, Murphy’s Guitars will be offering the new Murphy’s Guitars “All Access Pass” for just $10. The All Access Pass will grant customers access to a number of great deals year round such as 40% off guitar strings, 10% off accessories, 3 free picks each month, $10 setups when you purchase a restring at regular price. The all access pass will also get customers additional deals throughout the year, and will grant customers access to select events and workshops free of charge. 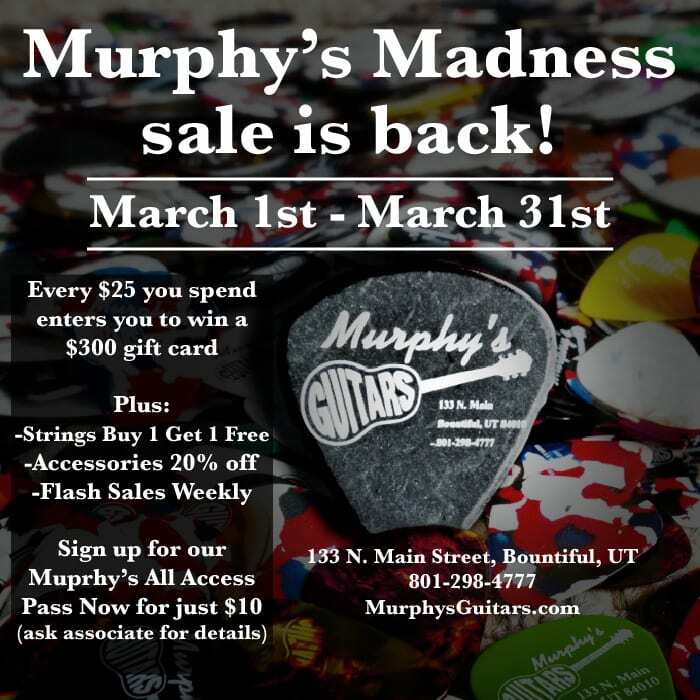 In addition to the release of the All Access Pass, Murphy’s Guitars’ annual Murphy’s Madness sale will run through the entire month of March. Through the end of the month customers can look forward to these great deals! Be sure to follow Murphy’s Guitars on Social Media to see our flash sales, and All Access Pass specials for the month of March, and if you sign up for your All Access Pass before Saturday March 25th you’ll guarantee your spot free of charge in our long awaited Home Studio Boot Camp workshop ($10 value). This entry was posted in Sales, Store News and tagged All Access Pass, Home Studio Boot Camp, Murphy's Madness, sale.